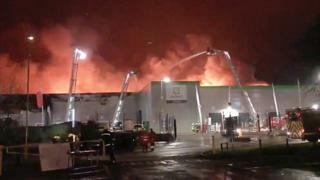 More than 30,000 orders – 10% of Ocado’s capacity – were processed at the Andover warehouse, which was on fire for four days. Chief executive Tim Steiner said: “The fire has been a setback, but it will only be a temporary one. Ocado also said that the initial investigation into the causes of the fire did not suggest there was any risk relating to its model, which relies on robotic warehouse machines to pack orders. Meanwhile, a temporary delivery outpost is being set up in Andover and capacity at another customer fulfilment centre in Erith is being increased faster than planned to cope with the disruption. Mr Steiner said that with the Marks & Spencer deal, he felt that “Ocado Retail has never been in a stronger position”. Sophie Lund-Yates, equity analyst at Hargreaves Lansdown, said: “Today’s announcement leaves no doubt Ocado has its eyes firmly on the future, with the group letting investors know last month’s warehouse fire will be nothing more than a temporary setback.